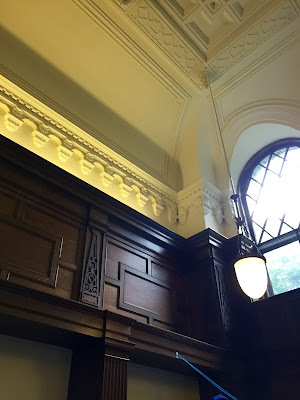 Photo Tour of The First Public Library in the U.S. - with Chris from Wild Moo Books! Hi, I'm Chris from the blog, Wildmoo Books. I'm here to share with you a photo tour of Scoville Memorial Library in Salisbury, CT, the first public library in the U.S. It’s located in the northwest corner of the state, just miles from both New York and Massachusetts. 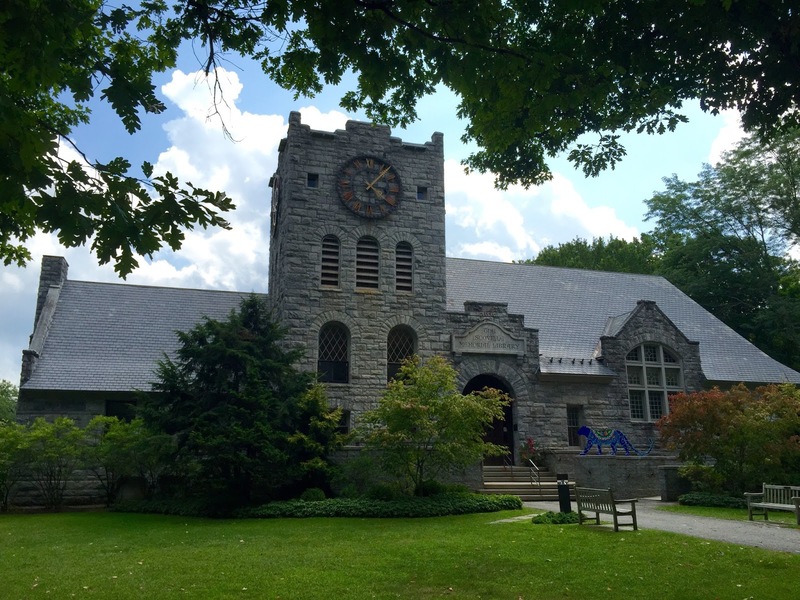 "Scoville Memorial Library was established in 1895. The Library as we know it today, grew from two historic libraries, one of which received town tax dollars in 1810, making it the first publicly funded library in the United States.” - from Scoville Library Website. 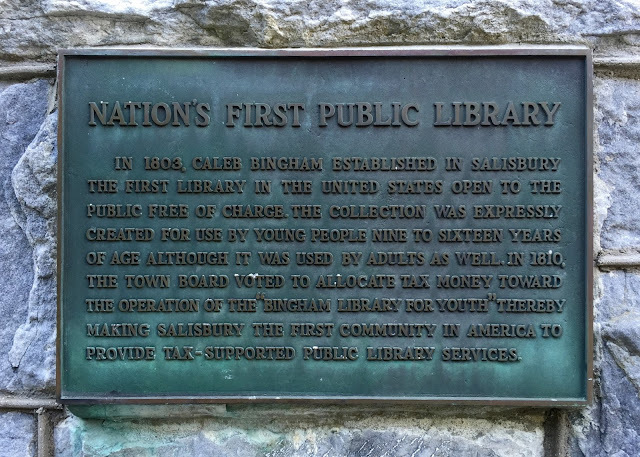 Plaque explaining why they are the first public library. The library has wonderful architectural details. 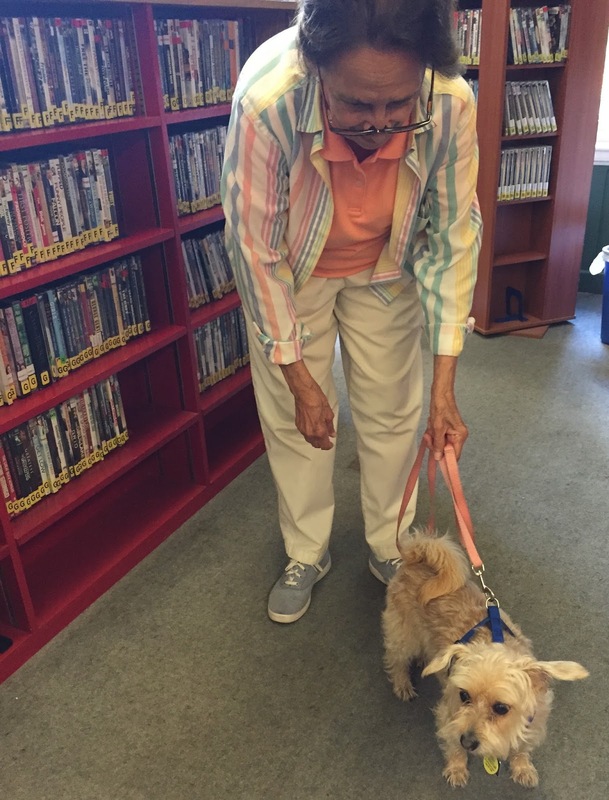 A patron and her dog inside the library! It's a gorgeous building, is it not? 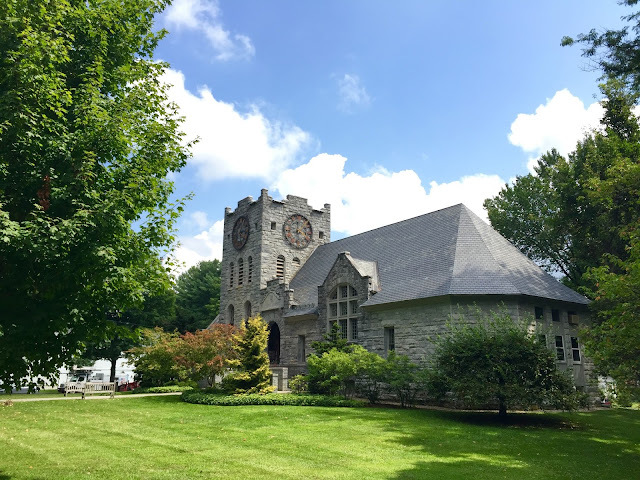 What do you think of Scoville Memorial Library? Have you ever been? Cozy Little Library Love with Julianne of Outlandish Lit! 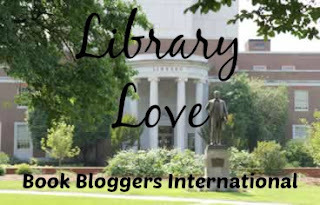 Hi, I'm Julianne and I blog at Outlandish Lit. 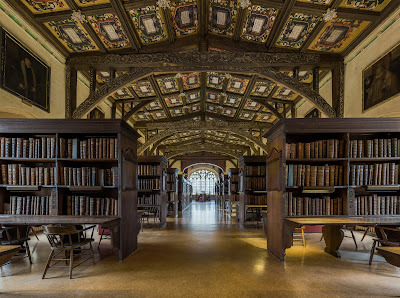 I'm not going to lie; I have a thing for big, overwhelming monsters of libraries. But ever since moving back to Minnesota from the big city of Chicago, I've found myself falling in love with the cozy little library of my childhood again. Sure, it doesn't have every book ever. But it's so cute! 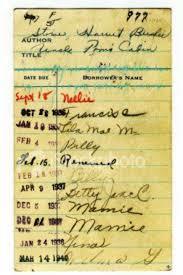 And you recognize the librarians because you've seen them since you were 7! And I'm really lucky that the Hennepin County library system has an amazing selection of books. It's SO QUICK about getting all my hold books to me. Their fiction section isn't quite as big as their nonfiction section, but the librarians are constantly highlighting great books. Recently I saw My Sunshine Away by M.O. Walsh and Wolf in White Van by John Darnielle displayed. I'm so grateful that there are librarians who are clearly paying attention to interesting new books that are out. The library also does a ton of cool stuff for kids. Like this tent to read in?? I know I'm an adult, but... can I please have a tent too? There are so many cool reading and art programs. I distinctly remember as a child there being a program where kids could apply to display a collection in one of their glass displays. It brought me such a sense of pride and achievement seeing my collection of Beanie Babies (because what else did 90's children collect?) on display for basically the entire world. I'm sure it was equally as exciting for everyone else as it was for me. Overall, my library is just a really welcoming place to hang out. The chairs are comfy and there are wide open spaces to work, use computers, or just read. One of my favorite things is going to the library with my grandpa after getting lunch together. I'll pick up my (enormous amount of) books on hold and he'll sit for a while reading the new periodicals or checking out the new nonfiction books on display. Browsing at my library is so soothing and it's always nice to see a friendly, familiar face. And if you didn't believe me when I said enormous amount of holds... Here's half of them. Visit Julianne at Outlandish Lit and leave a comment or question for her below!!! Previously a manufacturing city, Birmingham has been seeing a large financial investment since the late 1980s, resulting in whole swathes of the city being rebuilt to help make the place live up to the reputation of England's Second city (competing with Manchester for the title). 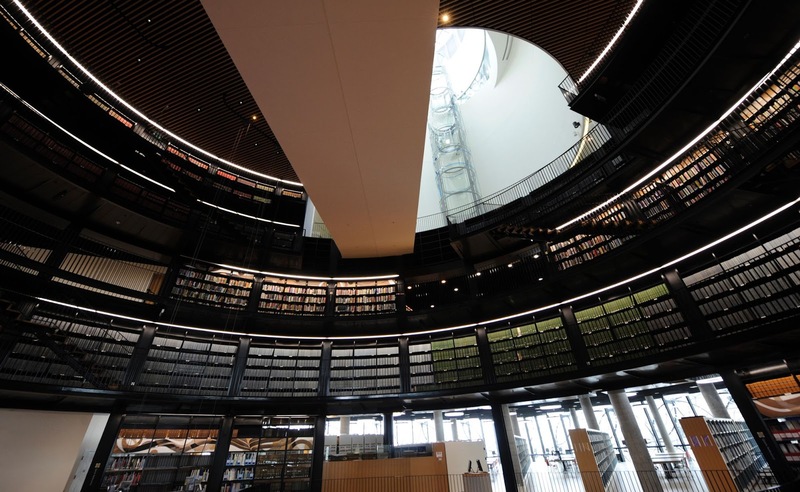 Moving into the 21st Century and attention turned to what to do with the Central Library. 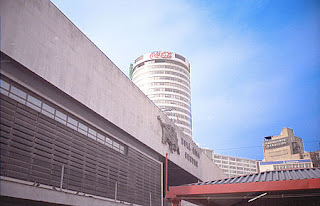 Brummies have a history of keeping ugly but emotionally significant buildings – when coming to rebuild the old Bullring Shopping Centre, everyone was fine until someone included The Rotunda in the demolition plans – cue uproar, the Bullring being rebuilt and The Rotunda is still untouched in all it's 1960 ugliness! It was a close call as to what to do with The Central Library, with as many people wanting to keep it as wanting to tear the thing down (guess which side I was on!). Finally, the decision was made to build a new library near by, transfer all services over, then close and demolish the old one. 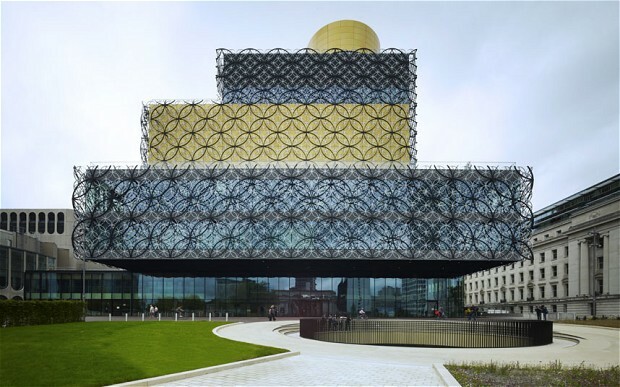 So, the new one was built and opened in 2013 (http://libraryofbirmingham.com/). Small controversy at the time in that 4 local libraries were closed in order to balance the books and justify the investment and opening hours of the new library. This meant that people on the outskirts of Birmingham, rather than having a Library on their doorstep, had to travel up to 30 minutes to get to a Library, often with children or the infirm and using public transport instead of a short walk down their High Street. Everybody lauded the new library....for a while. 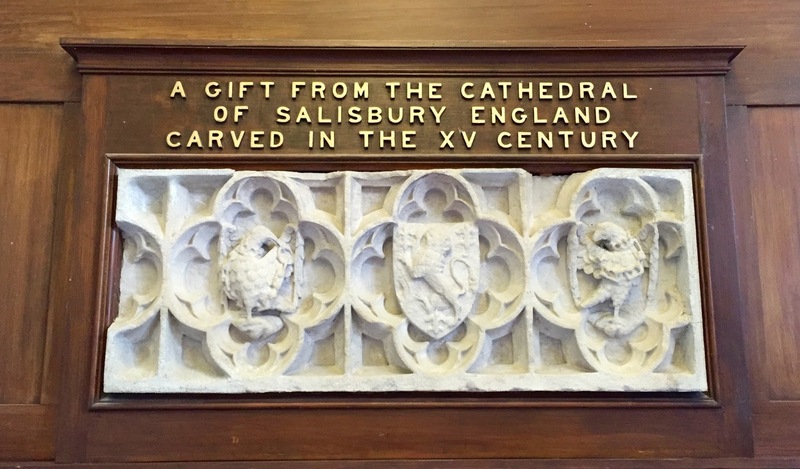 It was to be open 7 days a week, to 8 pm most evenings, having a cinema, meeting rooms, cafes, BFI films on tap, a Shakespeare room, author and child friendly events – and even books you could borrow! Malala Usefzai – Nobel Peace Prize winner and now Birmingham resident - opened it. The famous and the glamorous came to visit. Unfortunately it came at a cost. The building had been commissioned and designed in the late 2000s, at the height of the financial bubble, cost £189million to build, and opened after the crash. In 2014, it was announced that the opening hours would be reduced from 70+ to 40 per week, closing completely on Sundays. Community libraries across the city – not just the big one – have allegedly been banned from buying in new books and there's been a call for people to donate books under 12 months old in some libraries. Public Services (e.g. everything from Rubbish Collections, Road sweepers and through to the availability of Libraries, books and Library staff) are provided by the local City Council and they get their funding from two sources: Central Government – who are continually cutting or maintaining budgets – and the people of the city via Council Tax. If the Council Tax isn't allowed to increase, then services have to be cut, and it's a fine line that the Council have to navigate and they rarely get to make a decision without criticism from one source or another. As for me? I wasn't using the new library all that often when it was open later. I am a creature of habit and when I get home from work, I tend to head home and not go in the opposite direction to visit the library. I haven't borrowed a book from a library in 20 years (and 3 cities), not because I don't read, but I have hundreds of books in my house that have still to be read and I have the disposable income to buy the books I really want to keep. I do occasionally make it up there for a specific event, but that's generally on a weekend when I have time to linger. Therefore the reduced times don't affect me as much as it does others. I am certain that there are people who use it much more than I do: those who cant afford to buy books; students who need to look up information not available on the internet; people who plan to meet friends, and support where they can; people who don't have ready or free access to the internet. I am lucky in that I am covered in these areas though other methods. So, as the curse goes: May you live in interesting times. The furor over everything rumbles on, and I'm waiting for the next chapter. Visit Sorcha on her blog, Writing About Books, and leave a comment or question on this fascinating post below! Hi! I'm Heather from Based on a True Story and my library is the Akron-Summit County Public Library. I moved to Akron three years ago and I wasn't happy about it. 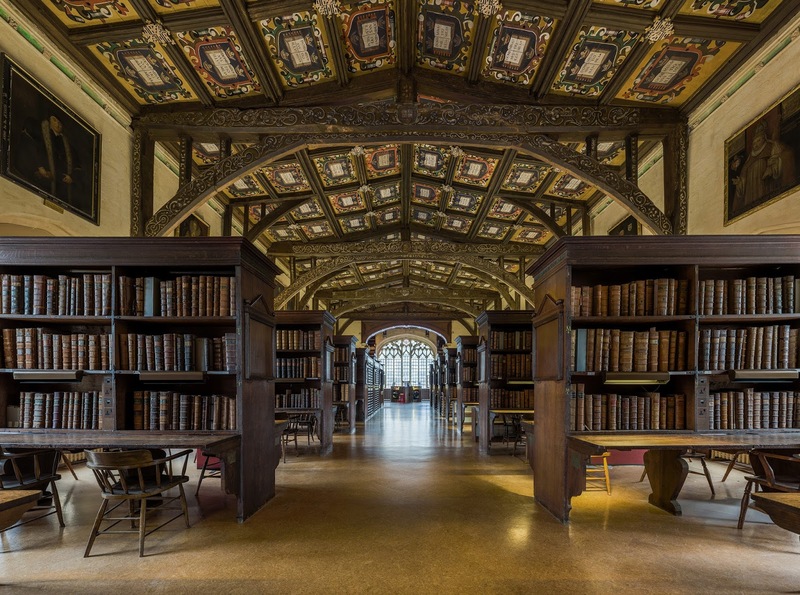 This library is one of the nice surprises that made the move all better. The main library is located in downtown Akron. 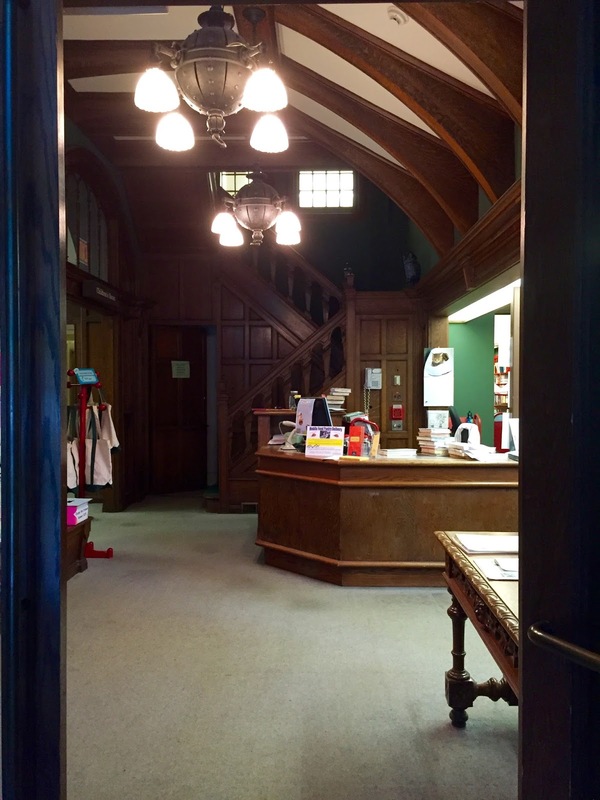 I had most recently lived in a small town in rural Ohio and wasn't prepared for what I walked into the first time I visited this library. I didn't realize how large it was because there is no main entrance that you can stand at and get a glimpse of the whole building. There are entrances all over on different levels. I come in through the parking garage. A view of two of the three floors of the library. 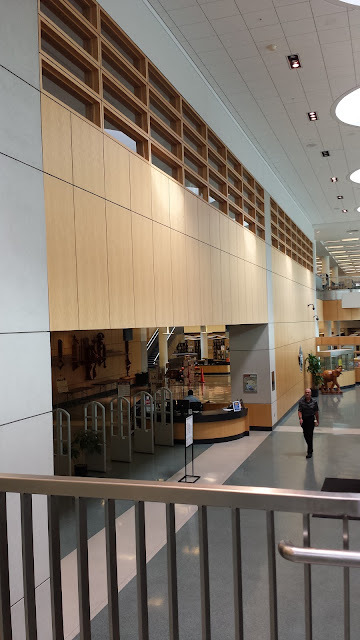 There is a library store and cafe on the bottom floor. 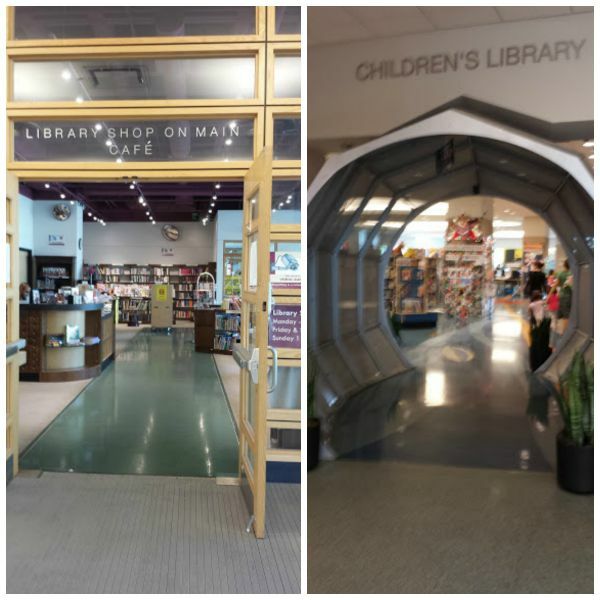 The children's library is accessed through this portal. Another thing that stands out is the art. There are sculptures all over the building. 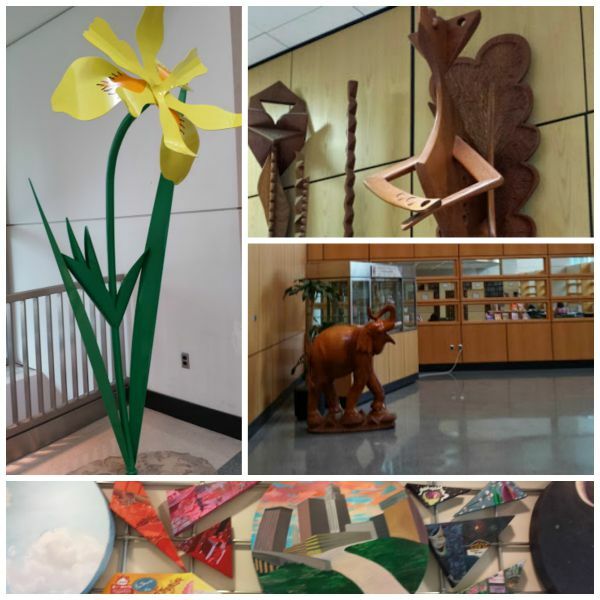 A major hallway serves as a rotating art gallery with projects ranging from schoolkid contests to professional exhibitions. Huge collection - I can find most things on my TBR list and anything I can't I can usually get through interlibrary loan. I request some weird things too. Great website and app - I can search the catalog, reserve books, modify and monitor my reserve list, renew books, and every ask for an interlibrary loan right from the website. 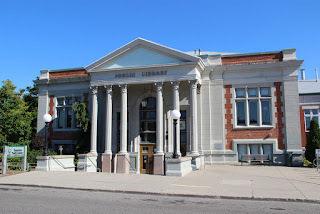 I can ask for the books to be sent to any of the 17 other branches of the library or six locations in the main library. I get my reserve books sent to a small branch that I pass on my way to and from work. Two week checkout periods. That's the shortest of any library I've ever joined. Crazy organization. I've gone on rants about them segregating authors by race. I also have very strong feelings about how they break up the nonfiction. It is on 3 floors. It isn't in numerical order. It isn't unusual to go to the first floor and find that the numbers before and after what you need are there but what you are looking for is on another floor. There usually isn't a sign that says where they are. They are just missing. For example, the travel books are in the fiction section. Excuse me, the Pop Culture section. They don't use the word "fiction." Makes me crazy. Thanks for sharing about your library, Heather! Leave a comment or question for Heather below to let her know you enjoyed her post!